BYOC – Bring Your Own Container. As in to a restaurant. Seriously. I know it sounds rather crazy, I mean you go out to eat so you don’t have to do dishes or cleanup, right? Well, I understand that bringing a glass or stainless steel container to a restaurant for leftovers, or your own glass container for beverages is a little out of the ordinary and/or inconvenient at first, but there ARE benefits to it. First and foremost, you are reducing the amount of styrofoam and plastic that gets used for takeouts. When I worked at a family style restaurant, I can’t begin to tell you the amount of styrofoam containers that we went through each week. When one would break the “closing tab”, we would just throw that away. Money down the drain for the restaurant. Filling the landfills with trash that won’t ever decompose. It’s not pretty. 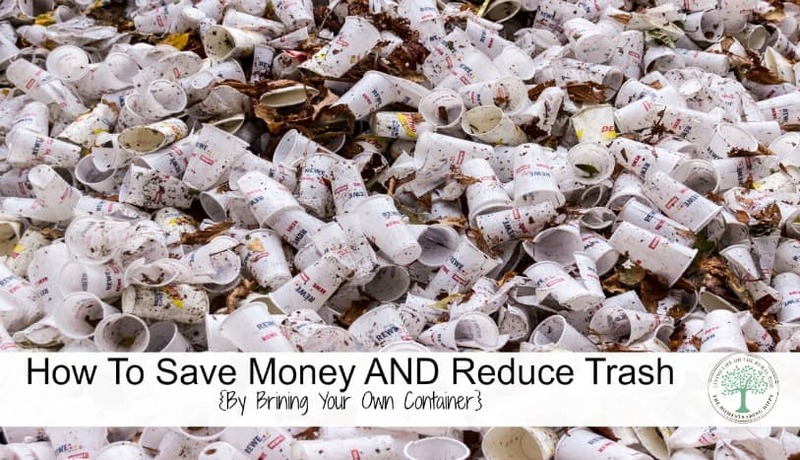 Bringing your own container saves you money. How? Well, when people get styrofoam to go containers for their leftovers, many would get left behind. That 1/2 sandwich that you could’ve eaten the next day got thrown away. Without a second thought on the part of the busboy or waitress. And, if you tried to go back even 20 minutes later to retrieve it, you were plain out of luck. Unless, of course, you wanted to get it from the garbage can… so, bringing your own glass/stainless steel container means that you are far more likely to remember those leftovers! There’s the added bonus of saving money on the beverages. Some, but not very many, of the places my family and I frequent give us a discount on our beverages simply because we are not costing the restaurant money on cups, lids, and straws. Starbucks gives a $.10 discount on every beverage if you BYOC, and Panera bread has given me my iced tea for free many times before simply because I don’t use the plastic cups and straws. That saves them money on supplies and cleanup, and some of the better managers will pass that savings on to the customer. It’s not hard to get started with bringing your own, you just need to do it. A simple mason jar will be just fine. That’s what we use. If you like to get fancy, try some jar lids from places such as ecojarz. I love them, as they make any narrow mouthed canning jar a to-go glass! Add in a stainless steel straw, and you are set! You can also make your own jar lids with the DIY instructions here. Of course, all the money spent on these items is worthless if you don’t remember to take them with you, right? I have a glass/straw/lid set in my computer bag, and when I get home after using it, I wash it and put it right back in my bag for the next time. My reusable coffee cup goes in there as well, so I am ready for hot and cold beverages. My family has a “to go” bag” that we have a couple of containers, some spoons, and our frozen yogurt place thermos containers. It’s hanging by the door, and if we decide to go out to eat, it comes right with us. Easy Peasy! Try it, what have you got to lose? Grab yourself a glass jar; either a canning jar, an old peanut butter jar, spaghetti sauce jar, whatever you have on hand, and stick it in your car. Next time you are out and get thirsty, bring it in with you and fill ‘er up! Besides, not having that “plasticy” taste, you are saving money AND trash! How do YOU save on trash when dining out? Be sure to pin this for later! Thanks, Kristi! You are so awesome!! Great prizes! I haven’t seen stainless lids like these before. These are great! Great idea for ways to reuse too. Thank you!